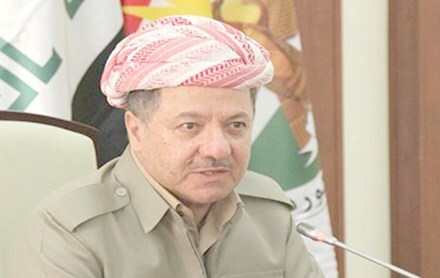 Salahaddin, Kurdistan Region of Iraq (KRP.org) – Following the unilateral declaration of an autonomous administration in Syrian Kurdistan by the Democratic Union Party (PYD), President Barzani issued a statement in which he expressed his concern about the future of the Kurdish people in Syria. "After the events in Syria, we believed that a good opportunity had presented itself to the Kurds in Western Kurdistan [Syrian Kurdistan], so that after decades of denial of their rights, including the right to citizenship, there now was an end in sight for the oppression of the Kurdish people and for them to finally secure their rights. I am concerned about the future of the Western Kurdistan and there is a danger that this golden opportunity will be lost on the Kurds," read the statement by the President. The President criticized PYD policies, including its unconditional support to the Syrian regime. "The Syrian regime has offered no rights to the Kurds for the PYD to offer its support to the regime. This is at a time when the Syrian opposition also considers the Kurds to be siding with the regime, and this will present our people with major problems in the future. As a result of the PYD joining the war, tens of thousands of Syrian Kurds have become refugees." The President offered Kurdistan Region's support to the Kurdish people in Syria, and called on all parties, including the PYD, to work together. But he added that the Kurdistan Region would not be able to support any one particular group. "In the last few days, the PYD has unilaterally declared its own administration in Western Kurdistan. We reiterate our position that we would only support efforts backed by all sides. We would not deal with any one-sided decisions. If the PYD continues to ignore others, it surely cannot, on its own, face the challenges and dangers ahead, and as a result the fate of the Kurds will be gravely endangered. If all parties do not return to the Erbil agreement, ... the PYD will bear responsibility for this lost historic opportunity."